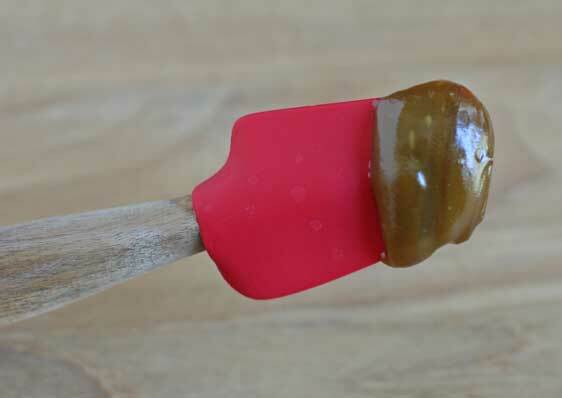 Caramel is sugar that has been heated to a liquid state, so that its molecules are restructured, giving it its characteristic color and flavor. Then the liquid evaporates off, leaving behind a sublime treat. 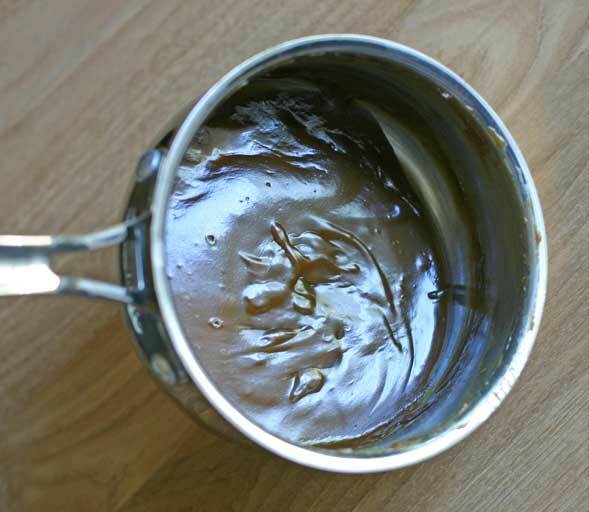 There are many varieties, but most traditional caramel recipes call for dairy products, such as cream, condensed milk and/or butter. Often the recipe will also include corn syrup. As you know, I avoid dairy, and although it’s possible to find organic corn syrup that does not contain genetically modified corn, the pervasiveness of genetic engineering makes that difficult, so I wanted to find a way to create my own vegan version made with whole food ingredients. The entire process takes just under an hour, much of which is unattended, and it is entirely worth the wait. Making this recipe fills your home with a sweet, delicious scent, and the taste is transcendent. 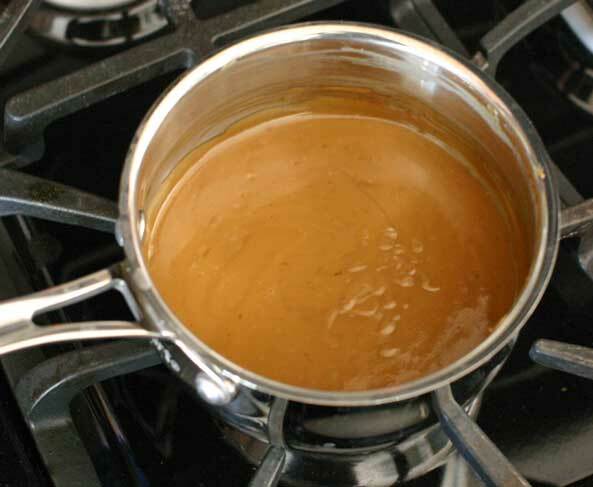 This caramel would make an excellent topping for your Thanksgiving pecan or apple pie. However, I also have another idea in mind. I’m working on a special dessert to share with you: pumpkin caramel brownies, and I’m going to try very hard — despite the deadlines I have to meet this week for work — to post it in time that you might be able to share it with your loved ones this weekend, too. 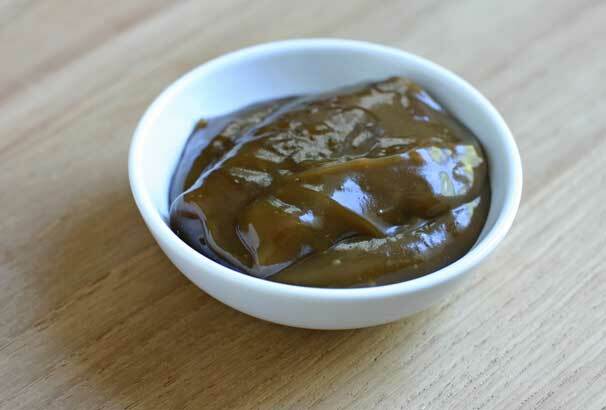 This recipe makes a small amount of caramel because it’s apportioned to the larger recipe it’s intended for, so if you want a lot of caramel, double up on the ingredients, but know that you may have to simmer it for longer as a result. 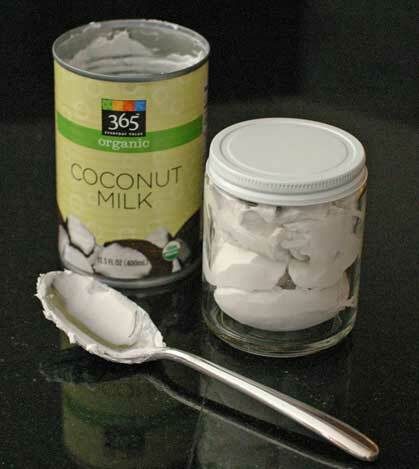 You’ll need to refrigerate a can of coconut milk overnight to obtain the coconut cream. When you take the can out of the fridge, open it and scoop out the cream that has separated to the top. You only need a tablespoon for this recipe. The rest you can store in a glass jar in the fridge until you need it. The cream keeps much longer in the fridge than a jar of coconut milk, by the way. 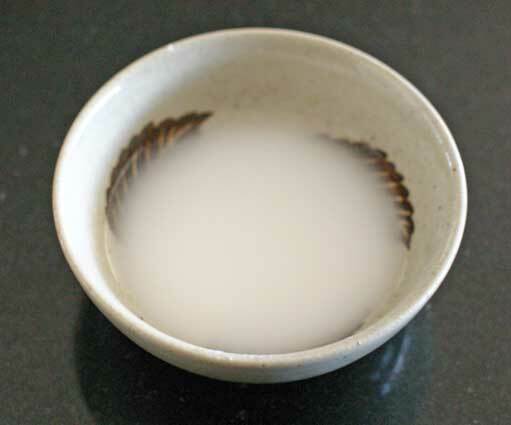 In a small saucepan over low heat, dissolve the sucanat in the almond milk. It is extra nice to use homemade almond milk for this recipe. 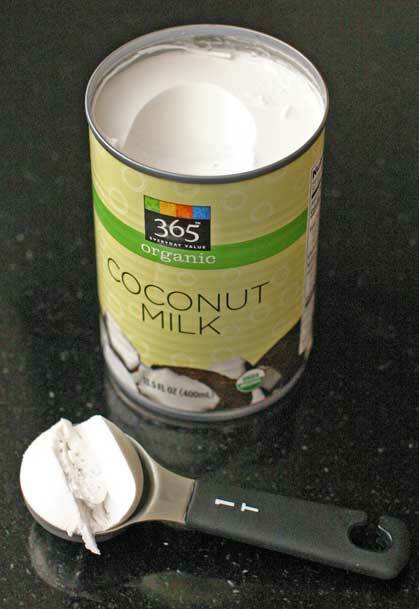 I tried this recipe once with store-bought almond milk and then I tried my own, and the second tasted much better. Stir in the brown rice syrup and vanilla. Here’s a little helpful hint: When measuring sticky sweeteners, grease the measuring cup or spoon with a tiny bit of oil first. Then the sweetener will slide right out. Arrowroot is an herb that serves as a natural thickener in food. You can usually find it in the spice or baking section of your supermarket. In a small bowl, whisk the arrowroot powder in a tablespoon of water with a fork, allowing it to dissolve. 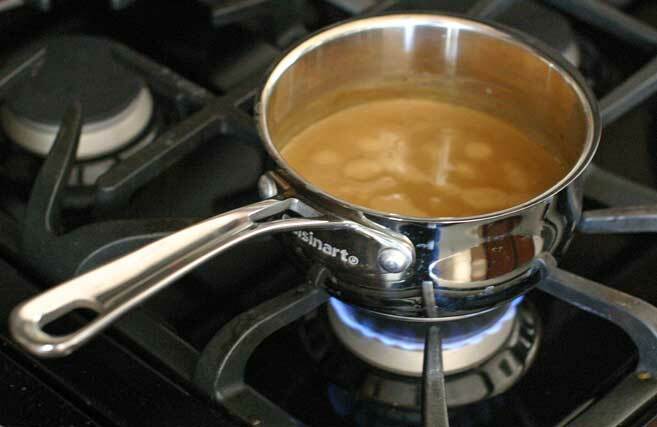 Then stir it into the caramel mixture. Continue stirring the caramel-to-be. I recommend using a silicone spatula, because it’s very effective at scraping the bottom and sides of the pan, thus preventing sticking and burning. Keep the heat low, just hot enough that it’s barely bubbling. I like to set the kitchen timer at ten-minute intervals, so I’ll remember to return and stir again. Once you’ve simmered the mixture — with periodic stirring — for about 35 minutes, start keeping a closer eye on it. When the caramel begins to take on a thick consistency that’s turning from liquid to solid, you’ll know it’s getting close to finished. Total simmering time should be about 38-40 minutes. When it’s done, it will have a sheen to it, and will creep slowly downward as a thick, viscous liquid when you tilt the pan. 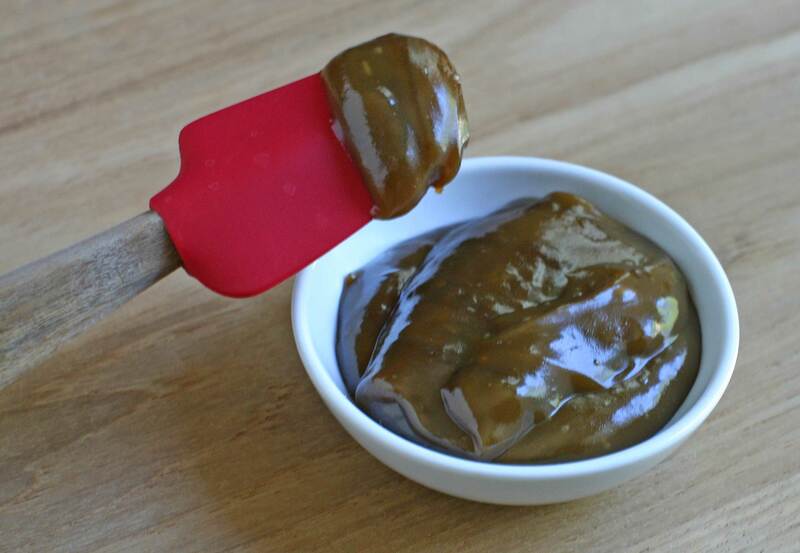 Use your silicone spatula to guide the warm caramel into a little bowl. You can store this covered in the fridge until you need it. Don’t you just want to wrap your lips around the end of this spoon? Yum!